 as an issue in urban Britain, specifically London. This website aims to draw on all the recent successes and information available in this field, one that is more pressing since the publication of the Governments Urban White Paper in 2000. Amongst many welcome proposals, this targets urban brownfields for development and regeneration. Such areas support many of the strong holds of the black redstart in the UK. A perceived conflict between development and nature conservation. In the case of black redstarts this may not necessarily be the case; this website/advice offers solutions for developers, architects, landscape architects and conservationists to help overcome some of the problems*. Details of schemes under construction, those proposed, plus innovative design solutions that can be implemented. 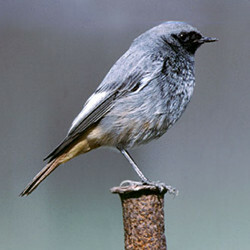 The ecology and history of the black redstart in the UK to underpin the advice. A section on green roofs and biodiversity deals with the broad benefits that such systems can provide in urban regeneration. This is one of the chief mitigations being sought within London.